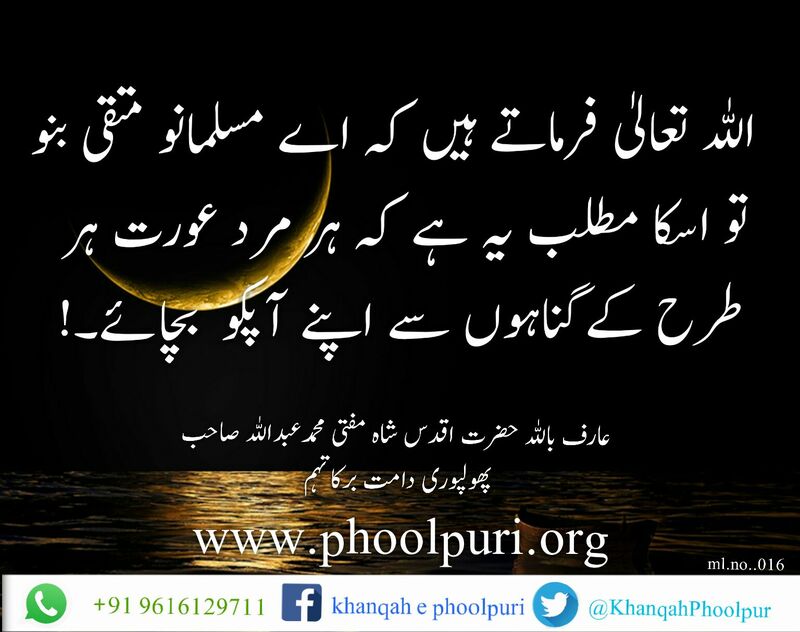 Allah states that O Muslims, become a muttaqi. So so this means every male and female should save themselves from every type of sin. Hazrat Shaykh Mufti Muhammad Abdullah Phoolpuri (DB) is one of leading mashaaikh of Tasawwuf in the present era. Hazratwala (DB) devotes himself entirely to the service of Islam. Hazratwala (DB) completed the Iftaa’ exam successfully and at the top of his class earning the first place position in his student days while Hazrat was in Mazahir ul ‘Uloom Saharanpur. Hazrat broke the 30 year old record held in the madrasah and earned the highest possible grades in the history of the madrasah. Hazratwala (DB) regularly delivers lectures, and he has written many books. Hazrat Shaykh Mufti Muhammad Abdullah Phoolpuri (DB) is one of the most gifted scholars of Islam today. His reputation and standing to the Muslims of Indian subcontinent needs no introduction. However, for the benefit of others, Hazratwala (DB) has been favored by Allah to have been spiritually nurtured by many of the greatest and most renowned Awliyaa’ (saints) of the recent past. Hazratwala (DB) regularly travels to many countries, transforming the lives of people all over the world. A testament to his deep love for Allah, his uncompromising dedication to Sunnah of the blessed Prophet (Sallallahu ‘Alayhi Wa Sallam), and his firm adherence to Shari’ah is that thousands of religious scholars and students of Islamic learning are among his students (mureeds). His inclination towards the Creator – The Almighty Allah began from his early childhood. He dedicated his life to be in the service of those pious servants of Allah, whom the world today refers as Ahlullah (saints) even before he became a teenager. From the tender age of 12, he began attending discourses of the renowned scholars of the time. His discourses permeate the listeners’ hearts with Allah’s love, greatness and the hope of salvation. Every word he utters brings one closer to the Creator – Almighty Allah. His company impresses upon those around him to converge their mental as well as physical ‘ being ‘ into living a life according to the Creator’s criterion. His discourses know no language, color or age barriers and even those alien to Urdu benefit. In his discourses and writings, he explores profound topics relevant to the Ummah at this time. Other ‘Ulama throughout the world benefit from and utilize his understanding and explanation of man’s relationship with Allah. They use his explanation about the prevalent spiritual and physical diseases and his prescription for their rectification as a crucial resource to aid them in their work. I cannot read this without crying profusely…May Allah fill his grave with Noor. Shaykh (Maulana) Hakeem Akhtar Saheb (RA) was born in a noble (middle class) household in the small town of Atheha (UP, India) in the district of Pratapgarh in 1928. The name of his father was Muhammad Hussain (RA) and he was a civil servant. He was the only son of his father with 2 daughters so his father loved him immensely. I have just been so busy with work and school that I find very little time to make phone calls, so most of my correspondence is through emails. So This morning I woke up and went to the madrasah to teach as I do any other day. I received a message from my Shaykh’s (DB) son, that said Hazratwala (DB) was remembering you and asking about you. Unfortunately I was busy in the madrasah and was unable to speak to him then and there and I quickly replied back that I will call later that evening. Being on opposite ends of the world means waiting the whole day to make that one phone call that would last about ten to fifteen minutes maximum, however, this feeling of anticipation had overtaken me and I could not wait for those twelve hours to go by. Finally I was able to call and speak to my Shaykh (DB). I do not recall ever having such fluid conversations with anyone as I have with my Shaykh (DB). So one may ask, “What’s the point of all of this?” I would say that is a valid point and a good question. One may ask, “What does that have to do with the title?” I would reply that is a good question also. The reason I bring this up is to highlight the fact that our Mashaayikh are so kind and caring that if we remain absent for a bit, they will not abandon us. Normally it is the mureed that yearns to meet the shaykh, and I know that anyone that is a mureed yearns to meet their shaykh as I also do, but it takes one to another world when the shaykh says that he yearns to meet the mureed. The reality is that the mashaayikh have no real need to meet with the likes of us, but it is their kindness and care that recharge our batteries, which keep us going good for a long time. Although we do not deserve their kindness and karam, but when the Ahlullah take karam from the unlimited supply of the Kareem, they serve it wholesale to the creation. If we can just pick up the akhlaaq of the Ahlullah, we would be set for this life and the next. I pray to Allah that He allows us to instill within ourselves the kindness and character of the Ahlullah. Aameen. The honor, greatness and love for the Prophet Muhammad (Sallallahu ‘Alayhi Wa Sallam) are deeply entrenched in the heart of every Muslim and are the core of Islam. Prophet Muhammad (Sallallahu ‘Alayhi Wa Sallam) and every Prophet of Allah is sinless. They are sent as guides for mankind and direct the people to the Oneness of Allah and His obedience. The Prophets of Allah possess the highest level of knowledge of Allah. They also possess the highest level of spirituality and sound character. Every Prophet of Allah condemned disrespect and violence. In Islam, we revere every Prophet of Allah and we do not tolerate any disrespect to any of them. There are three components in the posting online or anywhere of the depictions against the Prophet Muhammad (Sallallahu ‘Alayhi Wa Sallam): a) The image of Prophet Muhammad (Sallallahu ‘Alayhi Wa Sallam); b) disrespect/Defamation of his character and personality; c) The issue with the use/abuse of freedom of expression. Overall, Islam forbids making pictures of animate objects. One of the reasons for the prohibition of making and taking pictures of animate objects is that it distracts worshippers from the worship of Allah and can ultimately lead to idolatry. Specifically, in Islam, there are no pictures of prophets, or saintly people. Any alleged depiction of the Prophet Muhammad (Sallallahu ‘Alayhi Wa Sallam) is conjecture and invention by those who want to stir sensation and falsity. The second component of the cartoons is the disrespect and defamation towards the lofty character of Prophet Muhammad (Sallallahu ‘Alayhi Wa Sallam). This has caused great pain and anger to every Muslim around the world. Every Muslim has a right to assert his/her love for the beloved Prophet Muhammad (Sallallahu ‘Alayhi Wa Sallam) whom Allah sent as the final messenger to humanity, as mentioned in the Qur’an, Islam’s revealed text. Third, freedom of expression is not an absolute. It has overarching principles. If freedom of expression is absolute, then freedom of religion in a democratic dispensation should also be absolute. Why does freedom of religion have overarching principles? Why are Muslims not allowed to fully practice on every aspect of Islam without any restriction whatsoever? The reason is obvious. The rights of others living as equal citizens must be considered. What then about freedom of expression and right of dignity and religious honor? Freedom of expression has nothing to do with defaming Allah or His Messengers or the religious practices of societies. Such practices are no longer under the sphere of freedom of expression, but are simply campaigns to malign a faith, which serves dark agendas that breed hate, fear and ruin. In the midst of this, we turn unto Allah, the Guide, to enlighten people about the noble prophets, who are the teachers of humanity. We have firm faith that falsity always perishes before the truth. Any vilification against prophet Muhammad (Sallallahu ‘Alayhi Wa Sallam) is bound to be met with more interest and curiosity by honest and open-minded people about the reality of this man whom Allah proclaimed as a “mercy to the worlds” (Qur’an 21:107). I pray to Allah that He gives us all the ability uphold our honor and our pride-the Prophet Muhammad (Sallallahu ‘Alayhi Wa Sallam). Aameen!